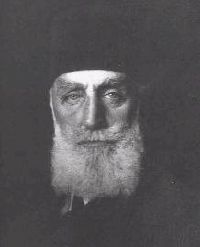 Abdülmecid II (also with various alternate spellings, including Abdul Mejid, Aakhir Khalifatul Muslimeen Sultan Abd-ul-Mejid, Abdul Medjit (May 29, 1868 – August 23, 1944; reigned November 19, 1922 – March 3, 1924) was the last Caliph of the Ottoman Dynasty, nominally the 37th Head of the Ottoman Imperial House. As caliph, he was 101st in succession to Abu Bakr. Effectively, the Ottoman Empire had already ended and with it any role for the Sultan in the emerging nation state of Turkey which, because of its alliance with Germany in World War 1 was anxious to distance itself from the Ottomans, its former dynastic rulers. The sultan, not the Turkish people, was responsible for crimes against peace. Since the new, post-Ottoman Turkey was to be a secular state, it decided to abolish the caliphate as well. Although Sunni Muslims around the world recognized the caliph, who in turn recognized the legitimacy of Muslim governments, they did not pay for his upkeep. Because the caliph was also the Ottoman sultan, he did not need outside financial support. The end of the caliphate corresponded with the period when almost the entire Muslim world came under colonial rule. In this circumstance, any role that a caliph might play would have been very restricted, since he would have little if any authority within the colonial space. In exile in Paris, Abdul Mejid II was maintained through the generosity of the Nizam of Hyderabad. However, the Nizam's princely state in India was itself subject to British oversight or paramountcy, so he needed permission, which he was granted, to remit money to the exiled caliph. Arguably, Abdul Mejid was still caliph but lacked any mechanism to act as one. Without his own state, Abdul Mejid could not hope to exercise any type of authority over Muslim governments or rulers across the world. Between the Fall of Baghdad in 1258 and the ceding of the caliphate to the Ottoman sultan in 1517, the Abbasids had also lacked their own state. However, they had been maintained by the Mamluks of Egypt. In the world of 1924, no Muslim state was in a position to assume a similar role, once Turkey had relinquished this. Abdul Mejid II cuts a somewhat tragic figure. He was a victim of history rather than a mover behind history. The end of the caliphate, however, has left one of the world's largest communities less unified than it was in the past, since there is no longer a "deputy" to symbolize the unity of all Muslims. On May 29, 1868, Abdul Mejid was born at Dolmabahçe Palace of Istanbul (formerly Constantinople) to then Sultan Abdülaziz. He was educated privately and was more or less confined to the palace until his 40th birthday. Abdul Mejid II married for the first time on December 23, 1896, at the Ortaköy Palace to Shahsuvar Bash Kadin Effendi (Istanbul, May 2, 1881 – Paris, 1945). They had a son, Prince Shehzade Ömer Faruk Effendi (February 27, 1898 – March 28, 1969). On June 18, 1902, he was married for the second time at the Ortaköy Palace to Hair un-nisa Kadin Effendi (born: Panderma, March 2, 1876; died: Nice, September 3, 1936). They had a daughter, Princess Hadice Hayriye Ayshe Dürrühsehvar (January 26, 1914 – February 7, 2006) who was married to Azam Jah, son of Osman Ali Khan, Asif Jah VII, the last Nizam of Hyderabad. On April 16, 1912, he was married for the third time at Çamlica Palace to Atiya Mihisti Kadin Effendi (born at Adapazarı, January 27, 1892 – London, 1964). She was sister of Kamil Bey. On March 21, 1921, he was married for the fourth time at Çamlica Palace to Bihruz Kadin Effendi (born: İzmir, May 24, 1903). On July 4, 1918, his first cousin Mehmed VI became Sultan and Abdul Mejid was named Crown Prince. He was given the title of General of Ottoman Army. Following the deposition of his cousin on November 1, 1922, who fled to Malta on a British warship, the Sultanate was abolished. However, on November 19, 1922, the Crown Prince was elected Caliph by the Turkish National Assembly at Ankara. He established himself in Istanbul, on November 24, 1922. On March 3, 1924, he was deposed as caliph and expelled from the shores of Turkey with the rest of his family. He was given 2000 English pounds in cash, then placed on the "Orient Express" bound for Switzerland. He eventually settled in Paris. Lacking any means of support but still styling himself Caliph, his precarious financial situation became the source of embarrassment to some people in the Muslim world including the Nizam of Hyderabad, who was both the premier Prince in British India and one of the richest men in the world. He obtained permission from the Governor-General of India to remit a monthly allowance to Paris for the upkeep of Abdul Mejid II and his family. In 1931, the Nizam decided to seek the hand of Abdul Mejid's daughter, Dürrühsehvar for his son. He sent emissaries to France to negotiate the marriage, who found that the Shah of Persia and the Kings of Iraq and Egypt were also interested in an alliance with the family of the former caliph. In the end, it was through a generous deal with Abdul Mejid that the Nizam's son married the Ottoman princess. Serving as Chairman of the Ottoman Artist's Society, Abdul Mejid II was a gifted painter. He is considered as one of the most important painters of late period Ottoman art. 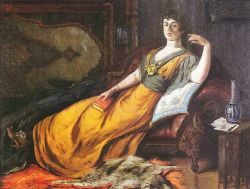 His paintings of the Harem, showing a modern musical gathering, and of a woman reading Goethe's Faust were displayed at an exhibition of Ottoman paintings in Vienna in 1918. His personal self-portrait can be seen at Istanbul Modern. On August 23, 1944, Abdul Mejid II passed away at his house in the Boulevard Suchet, Paris. He was buried at Medina, Saudi Arabia. The disintegration of the empire began before World War I, with the loss of Greece (1821) followed by the Balkan provinces in the 1870s. On the one hand, the European great powers were jealous of the Ottoman's vast empire while on the other hand they were divided in their views about its future. Austria-Hungary saw its own future as an autocratic empire linked with that of the Ottoman empire. Germany developed close links with the Ottomans, aiding the empire financially and assisting her with building a railway system. Britain was concerned that a weaker Ottoman empire would result in Russian expansion. Dismemberment of the Ottoman empire was on the agenda but avoided at the Congress of Berlin in 1878, which met to decide how the Balkans should be reorganized and to deal with the Ottoman's debt. A financial oversight committee was established, with a representative from each of the main powers. Various concessions were also negotiated. Known as "capitulations," these gave trade and tax privileged to the holders, mainly the French and the British who in certain areas operated as if they were the colonial power. Authority was also claimed over various religious minorities in the Ottoman space. The collapse of the empire was in the main due to a succession of incompetent but greedy rulers as well as to failure to implement necessary reforms. Abdul Mejid II was in no measure responsible for the empire's decline or fall, which took place before he was elected caliph. Arguably, he was caliph until he died. However, once Turkey stopped paying for the upkeep of the office, sending him packing with no visible means of support, the office was a title which no longer had any real meaning. The Nizam's support did not include establishing an organizational base or an office from which Abdul Mejid could play any significant leadership or even advisory role within the affairs of the Muslim world. Always intended to combine spiritual and political leadership, the question was whether the latter could be exercised if the holder did not actually possess any power? This is similar to the challenge that confronted the papacy during the long period in Christian history when Popes claimed ultimate temporal as well as spiritual authority. In their case, they acquired the Papal States as a platform from which they could claim to speak as a temporal ruler. With the loss of these states following Italian unification, the Popes realized that the leadership they ought to offer is moral and spiritual. Could a caliph who lacked any political authority or power try to provide moral and spiritual leadership instead? Arguably, the challenge is more difficult for the caliph, because he is not so much a religious leader as leader of a religious community. In Sunni understanding, the role of the Caliph was to provide leadership to the community but over and above leadership it was to symbolize unity. On the other hand, the caliph had no privileged right to tell Muslims how to interpret Islam, whereas the Pope does have the right to tell Catholics how they should understand their faith. Some Muslims wanted to restore or to revive the Caliphate. This was especially true in India, where a movement to preserve the Caliphate had started in 1919. Even the British may have favored the Caliph's continuation, if the title was held by a client-king such as the newly installed king of Jordan, which was within the agreed British sphere. Indeed, the British were attempting to bring Islam "under Britain's sway." A summit was held in Egypt in 1926 on reviving the caliphate but no agreement was reached and no action was taken. Mustafa Kemal Ataturk, founder of the nation-state of Turkey, was anxious to distance the Turkish people from their former rulers. By so doing, Turkey avoid being punished for its role in the war by the victors of World War I, which ended November 11, 1918. By abolishing the sultanate and allowing the allies to take control of all former Ottoman colonies, Ataturk ensured that Turkey would not be burdened with heavy reparations, as Germany was. Since Ataturk's Turkey was to be a secular state, there was no place there for a caliph, either. Disintegration of the Ottoman Empire contributed to the fragmentation of the Muslim world, which splintered into nation states, many of which were at the time under European control (in fact, only Saudi Arabia and Iran were independent and Iran as a Shi'a state had no interest in the Caliphate). Several Muslim states regard themselves as "leaders" of the Muslim world, and a certain degree of competition exists between these states. Choice of a caliph becomes problematic if a candidate from another, rival country were to be chosen. As long as there was a caliph, he could be recognized but once Turkey ceased to sponsor the caliphate, finding an alternative mechanism to choose or maintain the caliph was problematic. In fact, between 1258 when the Mongols sacked Baghdad and 1517, when the Ottomans conquered Egypt, the Abbasid caliphs had lacked their own state and had been maintained as puppets by the Mamluke Sultans of Egypt. However, at that time, the Muslim world, although splintered politically into separate entities, was much more united than it was post World War I. These entities were united by common beliefs, a common faith, a common law and still valued the role of the caliph as a symbol of this unity. The Muslim world of 1924 was different from that of 1324 or of 1424. As the last person to bear the title caliph, Abdul Mejid II's legacy is in some respects that of the caliphate itself. For 1400 years, the caliph symbolized Muslim unity. The caliph also symbolized the unity of religion and state, of spiritual and political leadership. Even when the Muslim world had fragmented into separate entities, most Muslim rulers obtained recognition from the caliph in order to legitimize their rule. A few chose not to do so. Some made rival claim to the title of caliph. Nonetheless, no one enjoyed as much support as did the 101 official successors to the office of "deputy of the prophet of God." In the absence of the caliph, no such system exists to legitimize Muslim rule. Technically at least, the caliph could withhold legitimacy to a ruler who failed to fulfill the responsibilities of good governance, as described in Islamic law. With the ascendancy of nation-states, governments derive their legitimacy with reference to constitutions and membership of the United Nations, not from a caliph. Arguably, there is no system within the Muslim world to police Islamic legitimacy. The Organization of Islamic Conference founded in 1969 could exercise this function, and can be said to have substituted membership of an intergovernmental agency for recognition of the Caliph. Abdul Mejid II himself was not so much as actor in history as a bystander, watching events unfold around him that brought his own world, and his own role within that world, to its end. ↑ David Fromkin, A peace to end all peace: the fall of the Ottoman Empire and the creation of the modern Middle East (New York, NY: H. Holt, 2001, ISBN 978-0805068849), 564. History of "Abdul Mejid II"
This page was last modified on 21 January 2019, at 16:58.